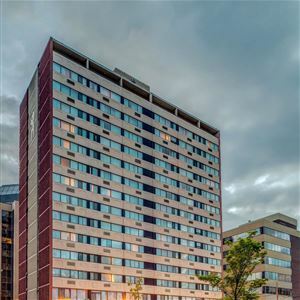 Property Location In the heart of Calgary, Best Western Plus Suites Downtown is close to Calgary Tower and Calgary Telus Convention Centre. This eco-friendly hotel is within close proximity of Repsol Sport Centre and Stampede Park. Rooms Make yourself at home in one of the 124 air-conditioned rooms featuring kitchenettes with refrigerators and stovetops. Your room comes with a pillowtop bed. 37-inch LCD televisions with cable programming provide entertainment, while complimentary wireless Internet access keeps you connected. Conveniences include laptop-compatible safes and desks, as well as phones with free local calls. Amenities Take advantage of recreation opportunities including a health club and a sauna. Additional features at this hotel include complimentary wireless Internet access and a fireplace in the lobby. Guests can catch a ride to nearby destinations on the area shuttle (surcharge). Dining A complimentary hot/cold buffet breakfast is served daily from 6:30 AM to 10 AM. Business, Other Amenities Featured amenities include complimentary wired Internet access, a business center, and complimentary newspapers in the lobby. Planning an event in Calgary? This hotel has 1164 square feet (108 square meters) of space consisting of conference space and meeting rooms. A roundtrip airport shuttle is provided for a surcharge at scheduled times, and free self parking is available onsite. In the heart of Calgary, Best Western Plus Suites Downtown is close to Calgary Tower and Calgary Telus Convention Centre. This eco-friendly hotel is within close proximity of Repsol Sport Centre and Stampede Park. Make yourself at home in one of the 124 air-conditioned rooms featuring kitchenettes with refrigerators and stovetops. Your room comes with a pillowtop bed. 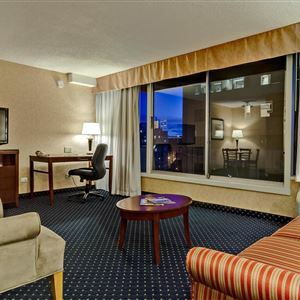 37-inch LCD televisions with cable programming provide entertainment, while complimentary wireless Internet access keeps you connected. Conveniences include laptop-compatible safes and desks, as well as phones with free local calls. Take advantage of recreation opportunities including a health club and a sauna. Additional features at this hotel include complimentary wireless Internet access and a fireplace in the lobby. Guests can catch a ride to nearby destinations on the area shuttle (surcharge). Featured amenities include complimentary wired Internet access, a business center, and complimentary newspapers in the lobby. Planning an event in Calgary? This hotel has 1164 square feet (108 square meters) of space consisting of conference space and meeting rooms. A roundtrip airport shuttle is provided for a surcharge at scheduled times, and free self parking is available onsite.